The motherload for all Harry Potter fans. There may never be another Harry Potter film, but that doesn’t mean that fans of the world’s favorite wizard can’t continue enjoying their favorite films. With the holidays just around the corner (no really, it’s almost October, aren’t there Christmas deals yet? ), Warner Brothers has a monster collection for Potter fans. 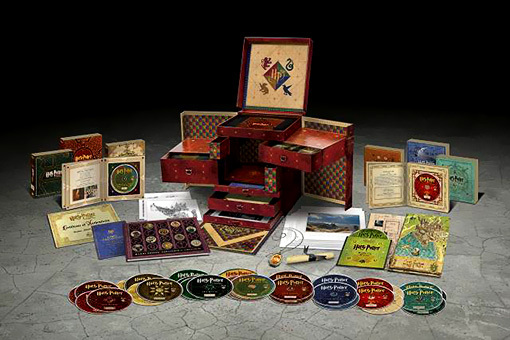 The Harry Potter Wizard’s Collection is a limited edition set containing over 37 hours of special features, including all previously released special features for all eight Harry Potter films. Also included are nearly five hours of exciting, never-before-seen bonus features that offer fans an unprecedented behind-the-scenes look at the creation of the Harry Potter franchise. Wizards and witches everywhere will enjoy the all-new documentaries like “Creating the World of Harry Potter, Part 7: Story,” in which J.K. Rowling sits down with the series’ screenwriter Steve Kloves and discusses the process of translating the books to the big screen. “Creating the World of Harry Potter, Part 8: Growing Up” incorporates new and vintage interviews with the cast to understand what it was like growing up on the set of the world-famous films, and ends with Daniel Radcliffe’s emotionally charged farewell speech to the cast and crew. Eight pieces of movie memorabilia, designed exclusively for the Harry Potter Wizard’s Collection by the graphic designers from the films, give fans a unique chance to bring the artistic details of the world of Harry Potter into their own home. High-quality concept art prints and a colorful fabric map of Hogwarts and the areas surrounding it are perfect for framing. The hard-bound “Harry Potter Catalogue of Artefacts” and the artistic “Label Collection” offer fans a broad look at the intricate details of each film prop. Also included are a blueprint poster of Hogwarts castle, sketch prints from the production designer, a Horcrux locket prop replica and a certificate of authenticity. In addition to the theatrical release of all eight films, the collection also includes the extended versions of Harry Potter and the Sorcerer’s Stone and Harry Potter and the Chamber of Secrets; and the 3D versions of Harry Potter and the Deathly Hallows –- Parts 1 and 2. Beautifully packaged in a gift box, the Harry Potter Wizard’s Collection is the largest collection ever released by Warner Bros. Films Included in this Collection – All on Blu-ray, DVD and UltraViolet. UltraViolet Digital Copy includes a Standard Definition Digital Copy of all 8 Harry Potter main feature films. Special features not included. § All New! “The Harry Potters You Never Met” – Meet the stunt doubles for Daniel Radcliffe, Rupert Grint and Emma Watson as they demonstrate how they balanced major stunt work with seamlessly mimicking the actors they represented and share their favorite moments. All New! “Designing the World of Harry Potter” – Explore how production designer Stuart Craig and his creative team brought J.K. Rowling’s imagination to life on the screen. All New! “When Harry Left Hogwarts” (Extended Version) – Hear candid and emotional stories about the final days on set in this extended behind-the-scenes look. § All New! “50 Greatest Harry Potter Moments” (Definitive Version) – Take a look back with cast members who share their on and off-screen memories. § All New! “Secrets Revealed! Quidditch” – At last, the secrets behind the special effects required for the breathtaking Quidditch scenes are revealed! § All New! “Secrets Revealed! Hagrid”- See the camera tricks, towering stand-in and voluminous body suits behind the beloved Keeper of Keys and Grounds at Hogwarts. Plus all previously released special features! Limited Time Offer. Restrictions and limitations apply.